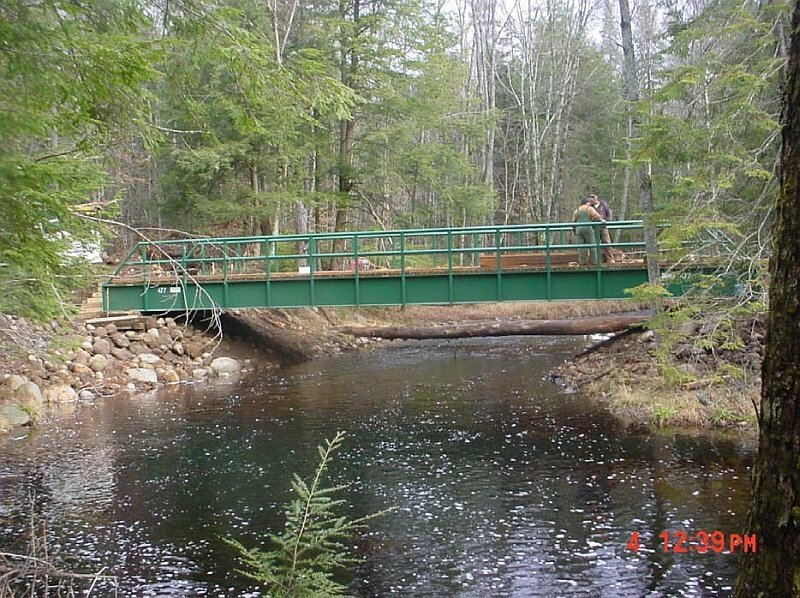 The New York State Department of Environmental Conservation (DEC) today announced that several upgrades have been completed on bridges and trails on state lands around Jefferson and Lewis counties in time for snowmobile season. Many of these improvements provide essential linkages on primary and secondary snowmobile trail networks across the Tug Hill Plateau and through Lewis County. 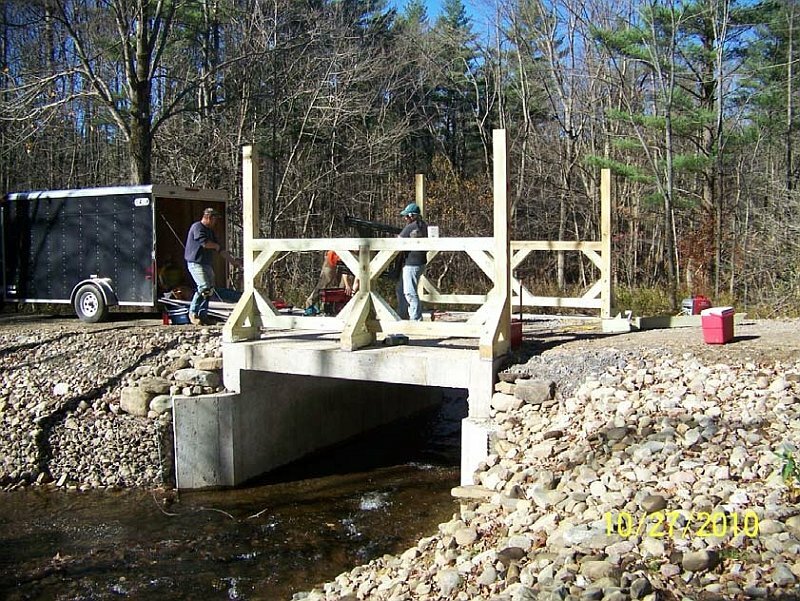 In November, operation crews completed a 20-foot long span of a 12-foot wide snowmobile bridge on the Gas Line Trail in Beartown State Forest in Croghan, Lewis County. This is part of the trail system maintained by the Missing Link Snowmobile Club, Inc. out of Carthage, NY. This bridge solves a significant water problem on Corridor trail C5, which is the only official east-west trail connection in northern part of Lewis County. 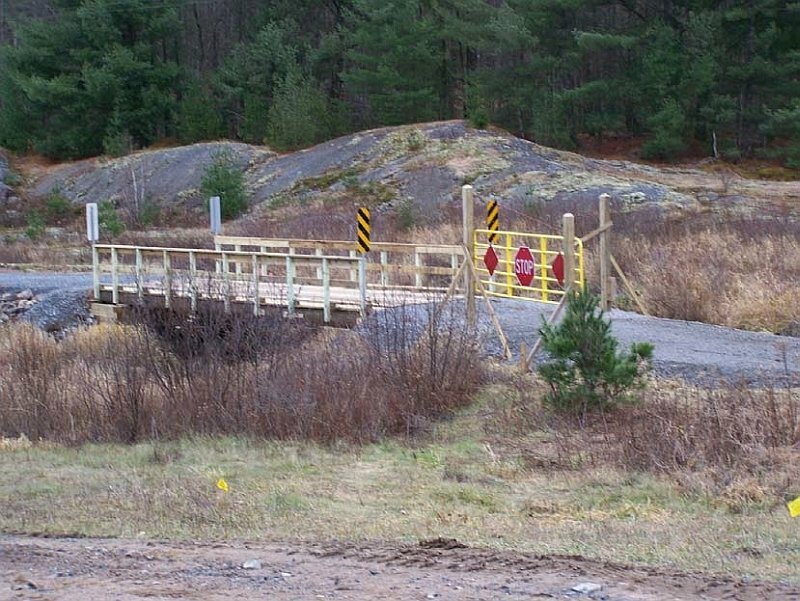 In August, work was completed on the Big Otter Lake Outlet Bridge – replacing a bridge that had been closed to the public seven years due to its poor condition. The bridge in Greig, Lewis County, restores a connection for Secondary Trail S77 and also provides a non-motorized connection for people walking or skiing from the Independence River Wild Forest to the Ha-De-Ron-Dah Wilderness. This was a major project that involved the construction of two 40-foot spans and a connecting section. The stringers were brought to the site during the winter of 2009-10 with the much needed help of the Brantingham Snowmobile Club, Inc.
During July and October, a DEC Operations crew completed the replacement bridge on the Hessel Road in Winona State Forest, which is in Lorraine, Jefferson County. This project began in December 2009. This bridge project maintains the snowmobile trail connection on S55, in addition to a Public Forest Access Road and ATV trail system connection. In September, a 3,200-foot re-route of a snowmobile trail onto Lesser Wilderness State Forest was designed and marked out. This re-route allowed for the re-establishment of Corridor Trail C4, which had been closed in this location. This trail is located in West Turin, Lewis County. This spring, DEC operations staff completed finishing work in order to open the Fish Creek Bridge on the Croghan Tract Easement Lands. 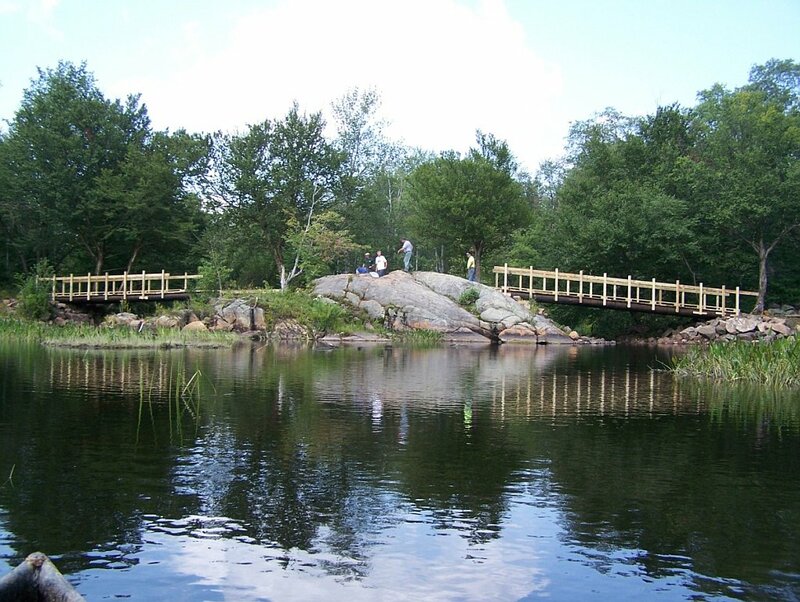 This bridge had been closed for five years due to unsafe condition. 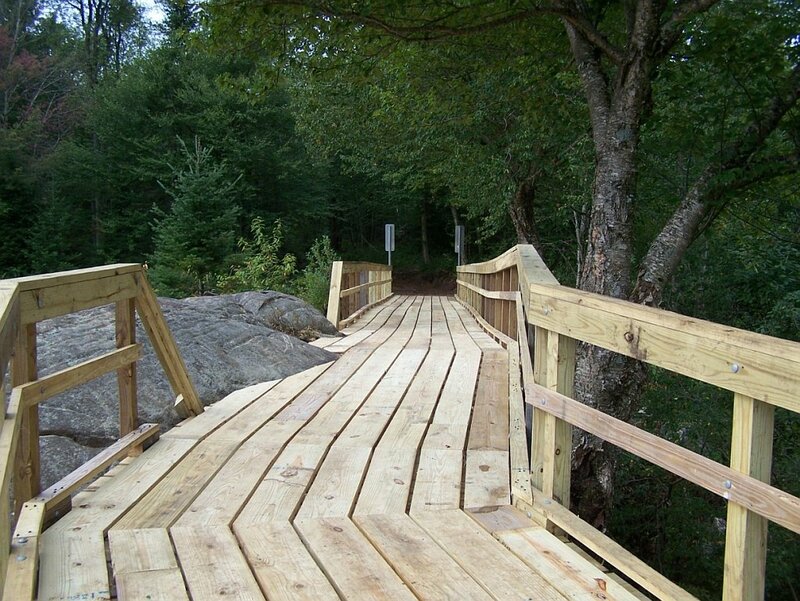 A new 58-foot steel span was installed that reopens the direct connection of Secondary Trail S87 to Corridor Trail C8, which is the major north-south snowmobile connection in the eastern Adirondacks. It also reopened the Croghan Main Haul Road to public motor vehicle use. For additional information about snowmobile trails on state and conservation easement lands in Jefferson and Lewis counties, please call supervising forester Fred Munk at the Region 6 – Lowville DEC office at 315-376-3521. What were the design loads used for the replacement bridges? Good question – check with DEC Region 6 for info.